Last Friday was the Annual Meeting of Psychotherapy St. Louis. Members gathered at the Relationship Center of St. Louis where we honored out-going Board members and celebrated our accomplishments over the past year. Bill and Linda Wing, LCSW(s) were our perfect host and hostess. My fellow Board members were a true gift to me during my term as President. 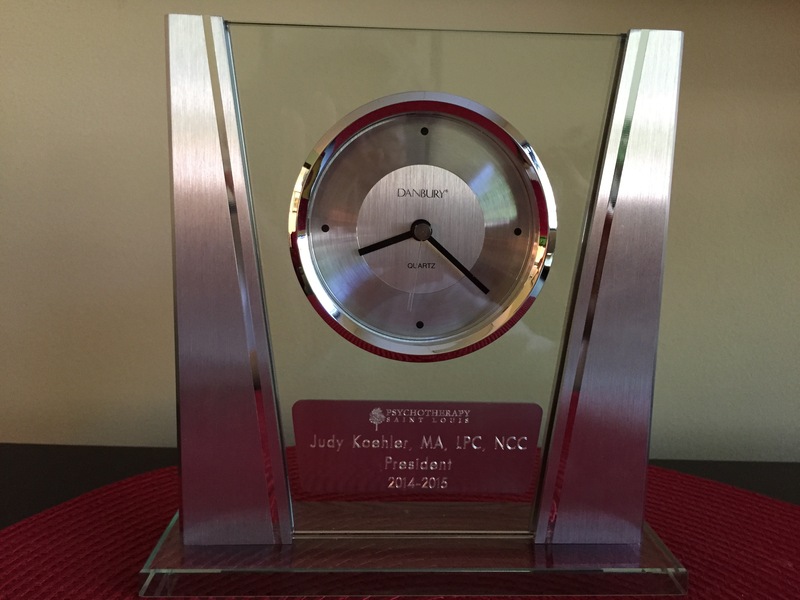 I received this beautiful clock as a token of appreciation from serving as President of the organization for 2014-2015. During our upcoming fiscal year, I serve a term as the current Past-President. Looking forward to another great year. I have no doubt that Sheri Rezak-Irons, LCSW will be a fantastic President who will serve the organization well. And I really appreciate this fine gift, Sheri — thanks!